It was a nerve racking start for Ryan Villopoto when he went down on the start of his heat race. His water pump cover was peeled back releasing the water and ending his race. He exited the track and had to take his chances at the last chance qualifier. He got another bad start at the LCQ, but was able to come from 12th to first in six laps to advance to the main. Hill won heat 1 and Windham heat 2. Windham was looking very smooth in the first heat taking advantage of every bit of traction with his incredibly smooth style and experience. Windham continued his streak through the first part of the main, taking the lead and holding it until Villopoto snuck by. Ryan Dungey was hanging back in third waiting for the right moment to pass. After getting past Windham, lapped riders came into play and took away Dungey's speed and momentum making it hard to get past Villopoto. It's unknown if Dungey could have won had it not been for the lapped riders, but it definitely took his momentum away in the final minutes of the race. 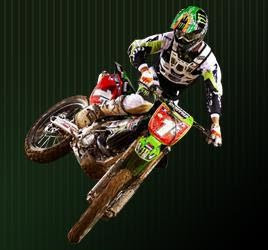 It was Villopoto though, that really had a night after the drama of having to go to the LCQ. He kept his composure and rode at a very high level showing his composure and experience to make up his 3 point deficit on the series with a win on the night taking the points lead by virtue of having the most wins on the season. Dungey will go into Atlanta tied in points with Villopoto at 145, but Villopoto does have the tie breaker if the season ended tonight. Josh Hill, who was previously tied for the lead with Dungey, had a bad night. He got of to a bad start and never got out of the middle of the pack finishing 9th dropping him to 3rd in the overall points battle 10 points out of the top. The Eastern Lites kicked off it's first round with last year's champ, Pourcel taking the win. Austin Stroupe grabbed second and the rookie Barcia got on the podium with a 3rd place finish just edging out Sipes who got tangled up with a lapped rider at the finish line. Pourcel starts the season with 25 points, Stroupe with 22 and Barcia with 20. Sipes was definitely upset at the lapped rider that got in his way, this might be cause for controversy with the points and everything else at stake here. If you're not a fan of Supercross yet, this could be the season to get into it. The action has been amazing and the lead has been up for grabs every week. The battle of the Ryans continues next week! Will it be Villopoto with his experience and consistency on the season, or Dungey, the rookie with his explosive speed, but mistake prone style as of late. It should be interesting to say the least. Supercross rocks! Unfortunately we do not get to see too much of it here in South Africa, except on television. Those supercross guys really take it to the next level, and I love watching them in action. Big respect to them all!